The exterior wall of a building serves design and functional purposes. A curtain façade carries components, protects against the weather and regulates the climate inside. Photovoltaic façades are being increasingly deployed as an architectural design element. They “advertise” the use of solar energy and reflect the ecological awareness of the building owner. Also, the replacement of conventional façade elements with thin-film modules is also attractive from an economic perspective as the PV systems not only provide solar energy, they also act as the building shell. 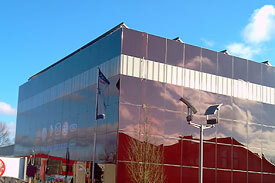 For example, a photovoltaic façade can replace expensive and complex exterior elements in the planning phase and, like them, project high prestige values. The constructive separation of thermal protection and weather protection gives the system long durability and consequently a high level of cost-effectiveness. Your photovoltaic project thus becomes a very popular form of financial investment which, thanks to the state-guaranteed feed-in tariff, offers a high degree of security.